Our sponsor this week is DigiStamp Boutique. Sally-Ann has a great selection of digi images to choose from. 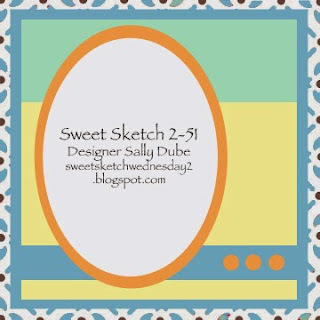 I've used an older one for my card this week but as I am relatively new to the world of the digi stamp they are all quite new to me. This image is from the Funtime Rosie set and I got the copics out to colour her. Dies are a mixture of Spellbinders and Memory Box. Flowers are an EK Success daisy punch that I have had forever. Pearls are from the craft room shelves. Thank you for visiting and I do hope that you are able to join us this week for a play. Oh Anne such a pretty card, I love this sweet image I've also used this one a few years ago we both have similar taste in images. Love your design papers this week they're so pretty with this image. Take care and have a wonderful week. Super cute card and lovely papers, great inside and out. Have you heard what is coming to Bailiff when Dews Garage is demolished? The Range, apparently the residents around there have been informed about the plan but I suppose it will depend on planning permission, hot of the press news there. Such a fun scene on your card this week Anne; I love the grass and clouds. Hope you have a great week.